Manfred Schreiber: What the hell are they doing? General Zamir: They are Arab terrorists. They are breaking their word. How does one approach the assassination of 11 Israeli athletes by Palestinian terrorists during the Munich Olympics? It's a disturbing bit of history, marking the first time murders were broadcast live, and a complete perversion of the ideals behind the Olympic games. Over three decades later, the pain caused by Black September still pierces the flesh and, sadly, is quite relevant to today's world issues. Thus, it is unfair to expect any movie to adequately address the event. 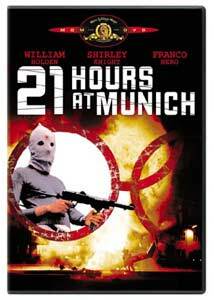 But it isn't unreasonable to demand that the film reflect an accurate tone of the hostage-taking, which is precisely where 21 Hours at Munich fails. Director William A. Graham goes to painstaking lengths in order to present a comprehensive narrative of September 5, 1972. He pauses on the Israeli athletes going to bed, capturing some of their conversations and gives a nice sense of the various personalities about to be thrust into unimaginable circumstances. He even constructs a genuinely suspenseful scene ini which the terrorists infiltrate the building and storm the Israeli's rooms. Led by Issa (Franco Nero), Black September is shown here as an assembly of misguided political ideologues, men who genuinely wish to liberate Palestine but lack a moral compass. Personally, I'm a bit queasy about this soft portrayal of these men, even if it does make for a more interesting characterization of Issa in the movie. There seems to be little doubt the terrorists had any intention other than killing these athletes, but the movie chooses to downplay this side of the coin. In fact, the few scenes that do show the Israelis held hostage hardly seem threatening, with all the actors just sitting and standing with no sense of tension. The script, based on Serge Groussard's book, The Blood of Israel, does not dwell inside the room with the hostages for very long. Rather, it focuses on chief of police Manfred Schreiber (William Holden) as he attempts to negotiate with not only the terrorists, but the Olympic committee and heads of state as well. Figures such as German Chancellor Willy Brandt and Israeli Prime Minister Golda Meir also become engrossed in the drama, trying to save the lives of these 11 men while refusing the Palestinian demands. There's a subplot concerning Issa's relationship to an Olympic security officer (Shirley Knight), who feels she can stop the bloodshed if allowed to continue speaking with Issa. However, the majority of the movie is devoted to relaying the events of that horrifying day, taking the audience through the bureaucratic debates on continuing the Games and the strategic planning by Schreiber to isolate the terrorists. The problem with 21 Hours at Munich is that, despite an earnest attempt to recreate the events faithfully, Graham's direction strikes all the wrong notes. He handles Schreiber's story as if it is a TV cop drama instead of a true story. From cheesy death poses to the inept score, the movie only seems authentic in the most pedantic of ways. Sure, the filmmakers get the timeline right, but none of the actors seem right for their role and the dialogue is weak. Failing to capture a sense of the horror and frustration these people must have felt, Graham turns this important story into nothing more than TV drama. When the closing credits rolled, I didn't feel any closer to understanding or appreciating the attack, but was overwhelmed by how the movie fails to offer anything valuable in its presentation of that terrible day. In truth, the attack by Black September seems something best left for documentary films to handle, and some have done so quite well (c.f. One Day in September). Image Transfer Review: For some odd reason, MGM has decided to crop the movie from its original broadcast ratio of 1.33:1 to an anamorphic 1.78:1 transfer. For the most part this does not effect the compositions in any noticeable way, though one close-up of Issa is fairly clumsy thanks to this move. Still, the picture looks fairly good. Some grain is present, but there's a nice sense of depth in the image and detail is commendable. Colors and blacks aren't impressive, though this might be the result of the source material. Audio Transfer Review: The mono English mix is clean and well balanced, with dialogue always being audible and the sound effects come across cleanly and with a surprising amount of force. Extras Review: Timed to coincide with Steven Spielberg's theatrical release of Munich, MGM offers this little-known film in a barebones release. The trailer for Hotel Rwanda is included. Although a sincere effort, 21 Hours at Munich cannot rise above the limitations of a weak script, poor direction, and bad casting, and this barebones DVD abandons the original TV broadcast ratio.